What is interviewing and when is this method useful? What does it mean to select rather than sample interviewees? Once the researcher has found people to interview, how does she build a working relationship with her interviewees? What should the dynamics of talking and listening in interviews be? How do researchers begin to analyze the narrative data generated through interviews? Lee Ann Fujii explores the answers to these inquiries in Interviewing in Social Science Research, the latest entry in the Routledge Series on Interpretive Methods. This short, highly readable book explores an interpretive approach to interviewing for purposes of social science research. Using an interpretive methodology, the book examines interviewing as a relational enterprise. As a relational undertaking, interviewing is more akin to a two-way dialogue than a one-way interrogation. Fujii examines the methodological foundations for a relational approach to interviewing, while at the same time covering many of the practical nuts and bolts of relational interviewing. Examples come from the author’s experiences conducting interviews in Bosnia, Rwanda, and the United States, and from relevant literatures across a variety of social scientific disciplines. Appendices to the book contain specific tips and suggestions for relational interviewing in addition to interview excerpts that give readers a sense of how relational interviews unfold. 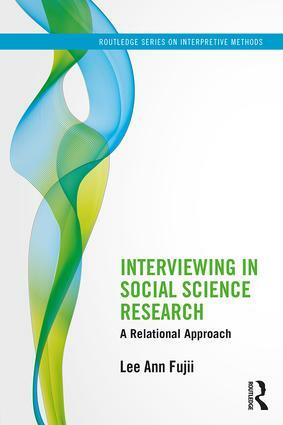 This book will be of great value to graduate students and researchers from across the social sciences who are considering or planning to use interviews in their research, and can be easily used by academics for teaching courses or workshops in social science methods. I Have My Data—Now What?